The first deployable EA-18G squadron was VAQ-132 "Scorpions", which reached operational status in October 2009.The first Growler operational deployment was announced on 17 February 2011. In service, the EA-18's radio name during flight operations will be "Grizzly". The "Growler" nickname sounded too much like the EA-6B's "Prowler" name, so "Grizzly" will be used to avoid confusion. By May 2011, 48 Growlers had been delivered to the U.S. Navy. 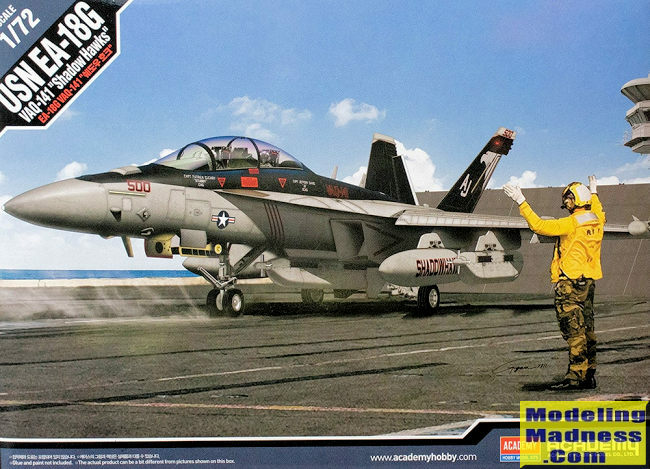 Since Academy had put the bucks into the F-18E/F Super Bugs, it wasn't much of a stretch for them to do the EA-18G. Just a couple of additional sprues for the wing tip pods and the jamming pods. As with the E/F kits you start by assembling the upper fuselage. This contains the upper wings and part of the lower. There are two lower wing/lerex pieces to put in place. You also have to fill in the guns and cut a section in the wings near the wing fold for some antennas. In addition, the undernose vents need filled and a large, square antenna needs to be removed. The instructions show all the mods you need to make. There is a rear lower fuselage section that includes the main gear and the gear wells are a separate piece. You are also required to build up the engine intakes and install the landing gear legs prior to trapping the horizontal stab when attaching the upper and lower fuselage sections. It is only then that you move on to the cockpit. This is the standard two seat tub with a two piece seat and control stick along with an instrument panel. There are five small decals to fit on the panel with one each for the side consoles. The lower forward fuselage also includes the nose gear well. The nose is more than just the radome; basically everything forward of the lerex and a single piece. There is a one-piece windscreen/canopy. To complete the airframe, you build up and install the nose gear, attach all the gear doors and the wheels. The wing tip pods are in place of the missile rails. 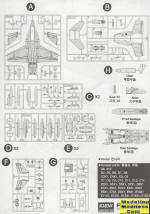 A supplemental instruction sheet covers the installation of the 'things under wings'. All the holes for attaching the pylons are already open and quite large. In the case of this aircraft, this means a pair of fuel tanks for the wings as well as a pair of jamming pods. One pod fits on the centerline as well. Outer pylons are provided and you must cut the missile rails from them. No missiles are provided for these. On the upper fuselage and wings there are additional antennas and strakes that need to be added. For some of these, holes will need to be opened early in the build. Instructions are very nicely drawn and you have three options. Two are for planes from VAQ-141. Actually, they are both the same plane, which is the CAG bird. One from 2010 and the other from 2014. They differ only by air wing tail codes and ship names. The third is a 6 Squadron RAAF plane. The decals look to be very nicely done and if you don't like that scheme, there are a ton of aftermarket options. Well, I have to say that the parts breakdown is a bit unconventional for Hornets from other kit makers, but it does work fairly well. 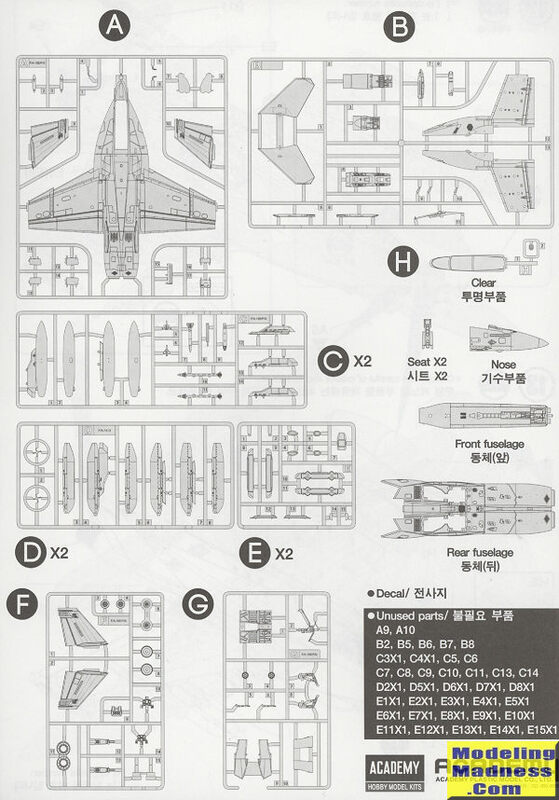 The large pylon attachment points will gain marks from many modelers as will the general simplification of the kit. Others won't like the pre-drilled holes or the one-piece canopy. Still, if super bugs in this scale are something you like building, then this is probably a good choice.